One of David Young’s opponents in the November General Election is calling on members of the House and Senate to keep Iowa’s small family farms in mind when it comes to the farm bill. 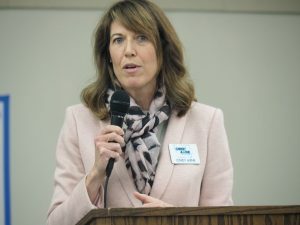 Cindy Axne, the Democratic candidate for Iowa’s Third Congressional District, addressed the latest situation surrounding the farm bill on KMA’s Morning Line program Monday morning. Recently, the House unanimously voted to go to conference with the Senate on a new farm bill. The small-business owner from West Des Moines believes the bill should offer more benefits to Iowa’s smaller farms.